Seismic waves are waves of energy that travel through the Earth's layers, and are a result of an earthquake, explosion, or a volcano that gives out low-frequency acoustic energy. Many other natural and anthropogenic sources create low-amplitude waves commonly referred to as ambient vibrations. Seismic waves are studied by geophysicists called seismologists. Seismic wave fields are recorded by a seismometer, hydrophone (in water), or accelerometer. The propagation velocity of the waves depends on density and elasticity of the medium. Velocity tends to increase with depth and ranges from approximately 2 to 8 km/s in the Earth's crust up to 13 km/s in the deep mantle. Earthquakes create distinct types of waves with different velocities; when reaching seismic observatories, their different travel times help scientists to locate the source of the earthquake hypocenter. In geophysics the refraction or reflection of seismic waves is used for research into the structure of the Earth's interior, and man-made vibrations are often generated to investigate shallow, subsurface structures. Body waves travel through the interior of the Earth. They create raypaths refracted by the varying density and modulus (stiffness) of the Earth's interior. The density and modulus, in turn, vary according to temperature, composition, and phase. This effect resembles the refraction of light waves. Includes Primary and Secondary waves. 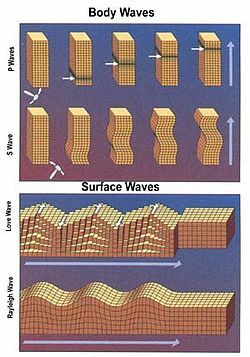 Primary waves (P-waves) are compressional waves that are longitudinal in nature. P waves are pressure waves that travel faster than other waves through the earth to arrive at seismograph stations first, hence the name "Primary". These waves can travel through any type of material, including fluids, and can travel at nearly twice the speed of S waves. In air, they take the form of sound waves, hence they travel at the speed of sound. Typical speeds are 330 m/s in air, 1450 m/s in water and about 5000 m/s in granite. Rayleigh waves, also called ground roll, are surface waves that travel as ripples with motions that are similar to those of waves on the surface of water (note, however, that the associated particle motion at shallow depths is retrograde, and that the restoring force in Rayleigh and in other seismic waves is elastic, not gravitational as for water waves). The existence of these waves was predicted by John William Strutt, Lord Rayleigh, in 1885. They are slower than body waves, roughly 90% of the velocity of S waves for typical homogeneous elastic media. In the layered medium (like the crust and upper mantle) the velocity of the Rayleigh waves depends on their frequency and wavelength. See also Lamb waves. A Stoneley wave is a type of large amplitude Rayleigh wave that propagates along a solid-fluid boundary or under specific conditions also along solid-solid boundary. They can be generated along the walls of a fluid-filled borehole, being an important source of coherent noise in VSPs and making up the low frequency component of the source in sonic logging. The equation for Stoneley waves was first given by Dr. Robert Stoneley (1894 - 1976), Emeritus Professor of Seismology, Cambridge.